Time for a new battery, and the one purchased from Tayna arrived in just under 24 hours, I could not believe it. I did not pay more for special delivery. The Battery was delivered by the carrier well within the stated delivery time. Filling this battery was rather primitive when compared with other manufacturers who provide a more fool proof acid container. This battery will only see periodic use as it is fitted to a classic motorcycle which is not in everyday use. Great service from Tanya Batteries, a top product, well packed and swiftly delivered! every thing good, quick delivery,good price, easy to order. excellent, thank you. First rate product. Backed up by excellent customer service. 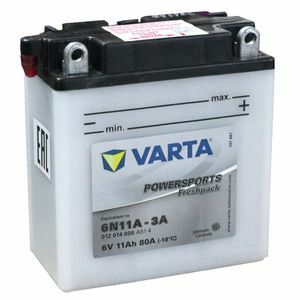 Varta is always our battery of choice. Perfect fit into the bmw r26 battery tray and a high quality product. Very happy. Friendly helpful service followed by super fast delivery. And pricing very reasonable too. As General MacArthur said 'I shall return'. Excellent service not only with the help of choice of battery, but also with the prompt delivery. I cannot rate this firm highly enough. Good Web Site - Good Value Product - Excellent Service & Response.